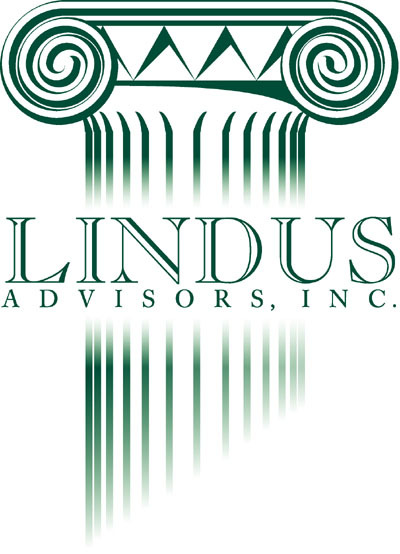 I was contracted to create the company logo, business cards and letterhead for the financial advisory firm Lindus Advisors. The company had an idea of what they wanted, a column, but they weren't sure exactly what they wanted it to look like or how to integrate it into their name. I sat down with them and explained that an ionic column would be best. Doric is too brutish and austere, Corinthian too ornate and conveys a sense of frivolity. Neither is what you want from an investment firm. I also suggested that the logo be based in a deep shade of green, for obvious reasons. Complete examples of the company designs can be seen here. The initial ionic column that I designed using architectural sources. The column with the company text logo superimposed. The "feathering" around the text was not created using Photoshop (because the image needed to remain scalable for use on layouts of differing dimensions), but was accomplished with a series of gradient fills.